Above are just a few examples of people who require added protection as the risks increase in today society for Lone workers. There are currently around 6 million lone workers throughout the UK. 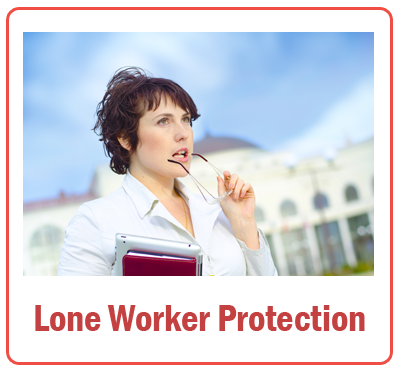 The employer has a legal obligation to ensuring that lone workers are protected adequately. The costs of protecting your employees or self are a lot less than you might envisage. AHS Monitoring provide services 24/7 365days of the year of fully automated GPRS, 2 way voice communication, data and GPS Lone Worker Tracking devices with advanced back up reporting with its own lone worker monitoring station. For pennies a day this service is a must for any company with lone workers in operation. Our devices are small, light, discreet, and easy to carry. They are usually attached to a lanyard or a belt buckle so that they are easily accessible in a panic type situation. In the event of the lone worker needing assistance, they simply press the button and this will alert the AHS Monitoring station who will then be able to listen into the device and assess the situation and act accordingly whether it may be alerting the emergency services or contacting the employer. Our devices have built in 2 way voice so we can communicate, track and locate the device within 5 meters and within seconds through our GPRS location devices. We can also provide the employer with a code so he can locate any of his lone workers at anytime. An alarm raised by a lone worker or other vulnerable person is a cry for help – for a response. It is in the ARC – alarm receiving centre – that the response is organised and without it the device or app which initiates the alarm is of limited value. The aim of this article is to shed some light on ARCs and their increasing importance in protecting lone workers and other vulnerable people. Estimates put the number of Lone Workers in the UK at around 6 million. What started in the UK some 10 years ago as a service for them and their employers has expanded to include other vulnerable people. While Lone Workers are still the main application in the UK, there is increasing use of these services in countries where individuals are at significant risk from attack. International travellers also use these services but providing a response for an individual in another country is still a problem. Last year there were over 50 million journeys abroad by UK citizens. No doubt similar figures apply to other nations. During that period there were 19,000 applications for assistance to the Foreign & Commonwealth office. The technology developed for managing Lone Worker alarms is flexible. More applications have developed to help other vulnerable people including care for the aged, treating patients at home, domestic violence victims, those living in hostile environments and international travellers. The flexibility is based on the capabilities of the monitoring software in the ARC and what it can do with the location, identity and situation information provided by the device or app. The ARC operator and the monitoring application work together with the information needed to initiate a response; location, identity and situation. These are essential to a) verify the alarm as genuine and b) give the information necessary to provide a proportionate response. The majority of ARCs use commercially available alarm management software to monitor intruder alarms, fire alarms, remote CCTV and vehicle theft. They integrate all alarm sources into the one operator monitoring station. However Lone Worker alarms are different in that the alarm is, with the exception of time out and man down alarms, initiated by a person who needs the operator to remain in contact via a 2-way audio link throughout the alarm, from initiation to completion. By their nature Lone Worker alarms are unpredictable as to situation and can last for some time. This goes against the basics of other types of alarm where the finances are based on maximum connection numbers and minimum operator numbers. For this reason two Lone Worker companies have their own dedicated Lone Worker ARCs with their own custom-built monitoring applications and their highly trained operators. Lately providers of Smartphone apps have developed their own web based monitoring applications. These are more flexible and can be integrated into an ARC. These companies, and there are only two or three of them at present, develop software that is more flexible in application, easier to upgrade and develop. They can therefore include a wider range of services based on their ability to use the available information and present it in different ways, including the benefits of more advanced workforce management and direction. Such web based systems are more able to operate internationally and put the focus where it should be – in the monitoring centre. The UK ARC is a sophisticated entity governed by British and EU standards. For those living in more hostile environments, and for international travellers, web based solutions are likely to be of increasing importance where the accompanying language issues demand the interoperability between operators in different countries with different languages. For them the ability to transfer alarm details across the web and across international borders using the same monitoring software, albeit in different languages, may well become vital. The variety of human situations which can lead to an alarm is almost limitless. Therefore the most effective operators are those who have the knowledge and experience to apply their judgment to any given situation. This is not something for everyone particularly considering the violent situations they might have to listen to while maintaining a calm and competent demeanour. Operators are the ‘friend’ of those in trouble and may be the only link between them and disaster. For this reason the Lone Worker ARC operator is a special type of person and should be selected accordingly. They may be dealing with social alarms at one moment and extreme situations at another where their knowledge, experience and judgement, applied without time to refer to someone else, may be critical. Bearing in mind the potential for extreme situations it is right that there is some control over who provides these services and the operators in the ARCs who will be looking after your employees. Also the emergency services do not want the sort of false alarm rates that occurred, and still occur, with intruder alarms. In the UK the relevant British Standard is BS8484 which is demanded by the police for their highest level of response. Part 6 applies to the ARC, the operator and their training. The British Security Industry association, (BSIA), has a dedicated Lone Worker section which represents the most responsible end of suppliers who have put significant resources into achieving the standard. The BSIA also offers extra protection to customers. It is in the interest of responsible organisations to choose suppliers who can demonstrate certification to the standard, not mere ‘compliance’. To meet the standard in the UK ARCs must be certified to both BS8484 Part 6 and Category 2 of BS5979. Lone worker alarm technology has expanded to include other personal safety and security services for a wider range of potentially vulnerable people. What happens in the ARC and the experience, training and knowledge of the operator is critical to a successful outcome to both extreme and mundane situations. With their inherent flexibility, web-based monitoring solutions are gaining momentum, especially internationally. Anyone using Lone Worker services is well advised to use companies that are certificated to the British Standard for Lone Worker alarms, BS8484.